Could Cora names be the next big thing? For a while, it was the Lily names everywhere, from Lily to Lillianna. Way back in 2015, I suggested the names would catch on. Why? The Downton Abbey effect. The graceful, gorgeous, kind-hearted Countess of Grantham answers to Cora, a name I fall in love with more with every passing season. The hundred-year rule. 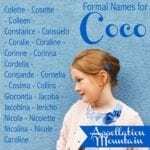 Conventional wisdom holds that it takes about a century for a popular name to fade, and then feel fresh again to a new generation of parents. Cora peaked in the nineteenth century and remained in the US Top 100 through 1912. If that’s the mark, then Cora’s comeback is right on schedule. The numbers confirm it. 2005 marks the year that Cora’s rise began. The name has gained steadily, entering the Top 100 in 2015, and now standing at #83. In other words? Lots of parents love Cora, and some are looking for similar-but-different alternatives. March Madness Baby Names 2014. Okay, I’m not sure that the winners of the annual baby names tourney has any meaning. But Cora did carry the day in 2014. Enough about why Cora could be big. Assuming this name continues to climb, what are the just-slightly-different Cora names to consider? Cora debuted in James Fenimore Cooper’s The Last of the Mohicans. Cooper probably based it on the Greek Kore, another name for Persephone, the goddess known for her annual retreat to the underworld, signaling winter, and triumphant return, ushering in spring. Today, many will think of the Countess of Grantham. True, the American-heiress-turned-aristocrat is a mother and grandmother. But she’s admirable, tough but loving. MTV gave the name to an adolescent werewolf on the most recent incarnation of Teen Wolf, and a handful of other uses have kept this name on parents’ shortlists. Read more about Cora here. 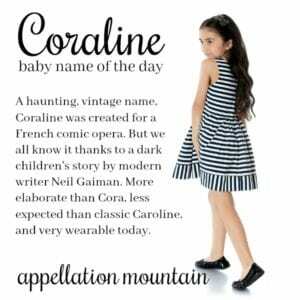 Coraline has some history as a given name tracing back centuries, but the name’s use in recent years is thanks to writer Neil Gaiman. His story Coraline was originally about a little girl named Caroline. He mis-typed the name, and found that he preferred his mistake. The book was published in 2002; a movie adaptation followed in 2009. The name went from obscurity to the US Top 1000 following the movie’s release. 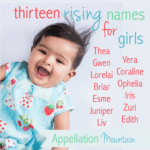 Given our love of names like Adeline and Evangeline, it’s easy to imagine Coraline climbing higher still. Read more about Coraline here. Corinne fared well in the nineteenth and early twentieth centuries, and then made a modest comeback in the 1950s. Today it’s still heard in small but steady numbers. It shares the same Greek roots as Cora. There’s an ancient poet by the name, and it picks up even more literary sheen thanks to an 1807 novel by the name, authored by Madame de Staël. The latter tells of a romance between a Scottish lord and an Italian artist, and was wildly popular in its day. Tailored and feminine, Corinne feels at home with Alice and Harper alike. Read more about Corinne here. Lear’s loyal daughter has a lovely name, and one that is surprisingly seldom heard. With Juliet and Olivia in vogue, why not Cordelia? Shakespeare based his character’s name on one used by Geoffrey of Monmouth, but updated the spelling from Cordeilla to Cordelia. Like many of Monmouth’s characters, she was more fiction than fact. But it remains an appealing literary choice, far rarer than you might expect. We love River and Kai, so why not the equally ocean-inspired Coral? Nemo’s mom in the Disney-Pixar classic answered to this name, and it made a fitting choice for the ill-fated clown fish. Maybe the name’s similarity to Carol makes it seem slightly out-of-date; or maybe it’s simply yet to be re-discovered. I’ve yet to write about Coral; check back and I’ll update when I do. 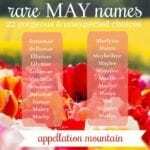 A pretty French spin on Coral, or possibly a form of Coralia, this rarity fits right in with Rosalie and so many other three-syllable, ends-with-y/ie names. Alice Hoffman chose it for her part-time mermaid in The Museum of Extraordinary Things. Read more about Coralie here. There’s a minor saint by the name, dating back to fourth century Thrace. The name comes from the Greek word for coral, so it’s wrapped up with many of the other Cora names on this list. And yet, we’ve all but forgotten this one, even in an age when girls’ names ending with -lia are so in favor. Corelia has been mentioned too, but I’m not sure if it’s another spelling for Coralia, or something else entirely. I’ve yet to write about Coralia; check back and I’ll update when I do. Possible spellings for Kori and company abound, and both Corey and Cory still appear in the boys’ Top 1000. But it’s only Kori that ranks currently. Some connect all of the Kori-Corey names to an old Norse name. 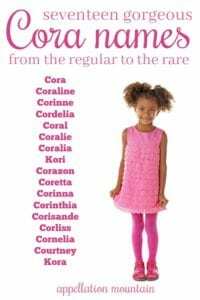 I’d guess that the average parent considering the name today is more drawn to all of the various Cora names on this list. Corazon boasts potential galore. It’s a word name, from the Spanish for heart, via the Latin cor. The name combines a tailored sound with that zippy Z. Maybe we still tie it to former president of the Philippines Corazon Aquino, the housewife-turned-politician following the assassination of her husband in the 1980s. That’s not a bad reference, though – history considers her a reform-minded and capable leader. For parents today, the name’s meaning might be a plus. I’ve yet to write about Corazon; check back and I’ll update when I do. Coretta started out as an elaboration of Cora. Today it brings to mind Coretta Scott King, wife of Martin Luther King, Jr., and a civil rights leader who shared her husband’s work and continued it after his death. Names ending in -etta aren’t especially stylish at the moment, but Cora makes this one feel surprisingly fresh and energetic. I’ve yet to write about Coretta, but check back and I’ll update when I do. Way back around the sixth century BC, a poet answered to Corinna. (Though some place her work a few centuries later.) Appropriately, it’s poetry that has kept this name alive. Ovid used it circa 15 BC. And then Robert Herrick penned “Corinna’s going a-Maying” in the seventeenth century. And then Bob Dylan recorded a song in the 1960s by the name, and Corinna entered the US Top 1000 briefly, in the 1960s and 70s. Today it feels rare, but romantic and wearable. I’ve yet to write about Corinna; check back and I’ll update when I do. A rarity I found in a book, Corinthia is used only occasionally. It comes from the ancient Greek city of Corinth, and might bring to mind St. Paul’s letters to the Corinthians from the New Testament. William Faulkner gave the name to a character in The Reivers, but she’s usually called Miss Corrie. I’ve yet to write about Corinthia, but check back and I’ll update when I do. First recorded in a Spanish romance from the Middle Age, Corisande probably comes from the Spanish word for heart – corazon, which appears earlier on this list. A handful of uses in history, literature, and opera have kept us aware of the name, but it is virtually unheard in the US. Read more about Corisande here. I hear “core less” and “careless” when I say this name, and yet, it’s rather appealing, too. It means joyful, and was originally a nickname given to a person seemingly without worries – free from cares. The name had a brief moment in the sun during the 1940s and 50s thanks to Meet Corliss Archer, a radio program about an upbeat teenage girl. It later became a comic book and a television series, too. Corliss could fit right in with names like Collins, Sutton, Harper, and Sloane today, but has yet to be re-discovered. Read more about Corliss here. Famed Roman general Scipio came from the distinguished Cornelius family; that means his daughters both answered to Cornelia, Major and Minor. Cornelia Minor became especially well-known as a model of virtuous womanhood in the 200s BC – and an influential figure in her own right. It’s thought the family name comes from the Latin word cornu – horn, as in cornet. Read more about Cornelia here. Should you hear Courtney called out on a playground today, the name probably belongs to Ava or Mason’s mom. And yet, sounds make this one a cousin to all the Cora names, even if Courtney’s roots trace to a French place name. I’ve yet to write about Courtney, but check back and I’ll update when I do. 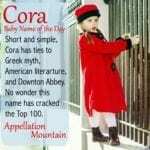 In many cases, Kora simply stands as an alternate spelling of Cora. The Germans use a K, as in Karla and Katinka. But Kora takes this name in an imaginative and global direction. In West Africa, a kora is a 21-string harp. Add an ‘r’ and Korra is the hero of Nickelodeon’s The Legend of Korra, a sequel to Avatar: The Last Airbender. She’s tough and capable, and almost certainly explains the sharp rise in girls named Korra in recent years. 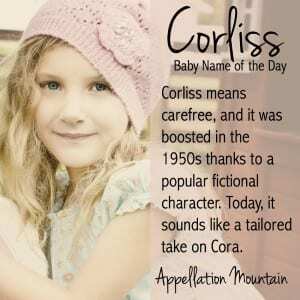 What’s your favorite Cora name? Any I missed? Originally published on March 20, 2015, this post was revised substantially and re-published on September 24, 2018. 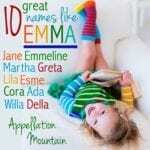 Cordelia all the way is one of my favorite names in general, and favorite from this list!! I’ve always thought that Corinne was very appealing as well. Not only Cora, but Corinne (The Desert Wolf) is also a Teen Wolf character. I would like to add Kori / Kory better known as DC Comics *Starfire* to this list. Her full name is Koriand’r (Coriander is a cool unisex option which I love!). I’m a ‘Corinnetta Zoë’, which is quite a nice elaboration of Corinne, and the two names go well together. I probably wouldn’t give my child a Cora name, though I’ve always liked the sound of ‘Cora Brody’. The English Corey is from the unisex Old Norse Kori, which is from the Old Irish ‘cuire’ meaning “troop, company; throng”. The female Greek Kori is a form of Korē [κόρη], meaning “daughter, girl; pupil (of eye)”. I’ve long loved Cordelia. Corliss has great appeal too. Corazon! Oh, I’d love to! Cora fits so nicely with Nora (Pete’s Dragon, summery-voiced singer Jones, and nickname for powerhouse Eleanor). It’s feminine and soft, strong and solid. Gorgeous dichotomy. Abby, your lists are always so perfect! And I think you are totally right that Clare is the new Lily… it’s like Hannah of the late 90s! I’d like to add that Korra is a variation used for the heroine of Nickelodeon’s The Legend of Korra, a series following the Avatar seventy years after Avatar: the Last Airbender takes place. Excellent point, Kathleen – thank you! I have a Cora. She’s a fiery little girl…. strong, independent, empathetic, and 100% more work than previous children. I adore Coretta above all, but Cordelia, Cornelia, Corinne and Cora are all names I’d happily use. There’s one more, not on this list! Corelia can be found in Imola, Italy, in 1312. I love this one. And the form Corella, a nickname of Cora, occurs in Valencia in 1510. I love Cora, Coralie and Cordelia, but my heart belongs to Coral!